For weeks I had been mentioning Ethiopian food to a colleague who wanted to sample some. Having been to a few Ethiopian restaurants in the city that I have reviewed and one that I hadn’t reviewed, I wanted to return to the latter. 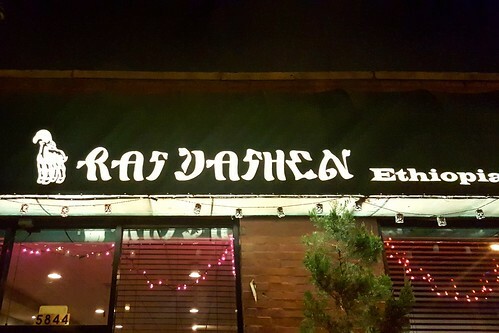 With my restaurant advisor joining us, Ras Dashen at 5846 N Broadway Street was the destination for some cultural dining after coming down from a Thanksgiving high. Nice and spacious on the inside with seating that accommodates those who like traditional Ethiopian seating or those who prefer tables, Ras Dashen has a comfy feeling. The atmosphere is relaxing such that you can enjoy the complete dining experience while also engaging others in your party without competition from too much acoustics. 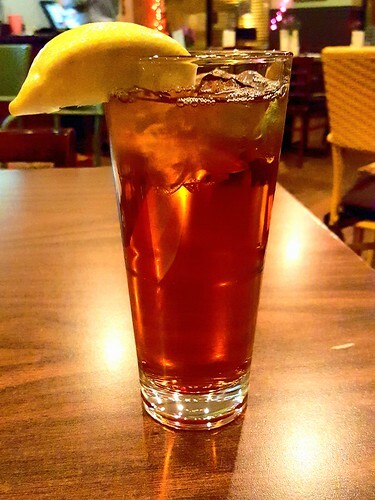 We started with qezqaza chai, which is cold red tea accented with spices commonly found in Indian tea, like cinnamon, cloves, and black peppercorns. 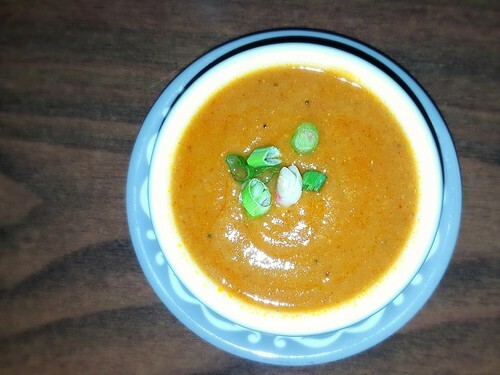 Along with the tea we indulged cups of mereq, this version cooked with creamed lentils, boasting a flavour akin to puréed mild, sweet potato soup. For the main platter, we spared no expense. In keeping with opting for variety, we ordered one chicken, one lamb, one seafood, and a round of vegetarian menu items. The chicken was doro wat, which was dark meat chicken and boiled egg in a spicy berbere sauce. The lamb dish was yebeg de berbere, succulent lamb stew bursting with bold spices. The seafood dish was asa wat, fillet tilapia in a dark berbere sauce that had been prepared from roasted, ground flaxseed. As to the vegetarian offerings, we had telba shimbera misser wat — puréed chickpeas, split peas, and flaxseed in a dark berbere sauce. There was kik alicha, which were puréed yellow split peas cooked with onions, garlic, ginger, and green peppers. We even had tikil gomen alicha — spiced cabbage, potato, and carrot stew. And a final vegetarian item we ordered was ethio salata, which came as romaine lettuce, green onions, cucumbers, tomatoes, and jalapeños. There wasn’t one item that we did not enjoy thoroughly, evident from the empty platter when we were done. 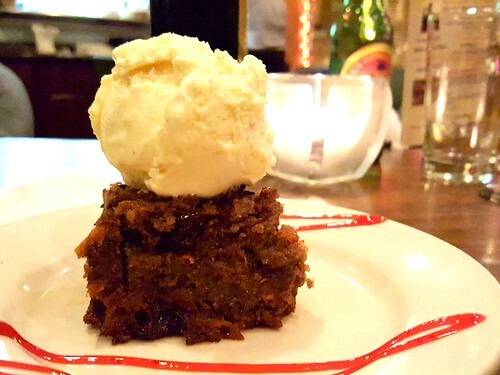 The finale was a plate of Ethiopian bread pudding topped with a scoop of vanilla ice cream. In the same vein of employing cinnamon and cloves in recipes, the bread pudding had both and a nice share of raisins, dates, and nuts. Served warm, it was a fantastic ending to a hearty and delectable cultural meal. No Ethiopian meal is complete without tea or Ethiopian coffee. Although there was no Ethiopian coffee service, complete with toasting the beans and going through a ritual, a pot of Ethiopian coffee simply can’t be beaten. Those who have taken Ethiopian coffee will attest that it bests any franchise, chain, or independent coffeehouse trying to play like a franchise or chain. The same is applicable to the coffee at Ras Dashen. When it comes to Ethiopian food, individuals either love it or hate it. It is best enjoyed in a communal setting with a group of friends or family. The injera bread may be a different flavouring on the palate for many because of the slight tangy taste, bordering on what a few may deem as sour. However, mixed with hearty sauces in the vegetables and meats, the whole dining experience is a winner. Chicago’s Edgewater community houses several Ethiopian restaurants, so you can get a good selection of Ethiopian fare from each. I highly recommend Ras Dashen for not only good food, but also for outstanding service and quality all around. 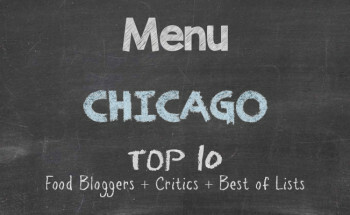 When friends come to visit Chicago, I often wonder where to take them for a proper Taste of Chicago. 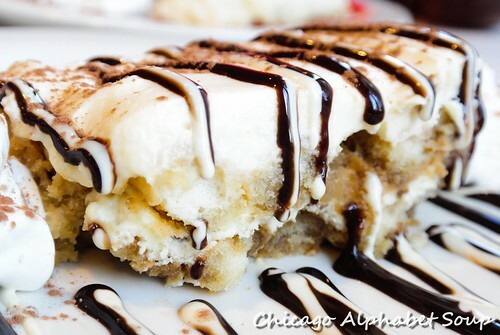 Many come with expectations of going to the usual tourist traps: Cheesecake Factory, any of the Chicago style pizzeria restaurants, some sports bar in Wrigleyville, Garrett’s Popcorn shop, and a few other dated restaurants like Hard Rock Café and Planet Rock. But you can get that fare from anywhere. Then again, I pick restaurants from a self-serving standpoint. If I’m treating, I’m getting what I want. With my recent guest, they did not want to go to any tourist magnets. They wanted international fare was. 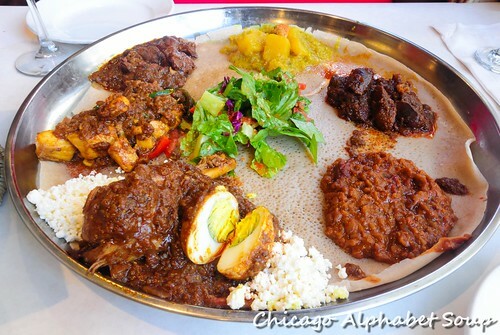 After an afternoon of taking advantage of Shedd Aquarium, I offered up the suggestion for some Ethiopian food. So, we were off to Demera Ethiopian Restaurant at 4801 N Broadway Street. Nice and spacious on the inside, welcoming and homey per the service, this was a great option. 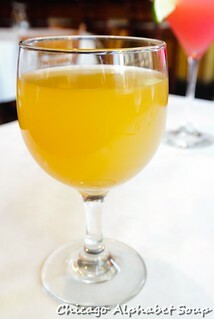 We started with a glass of tej, which is honey wine, or rather the nectar of God. 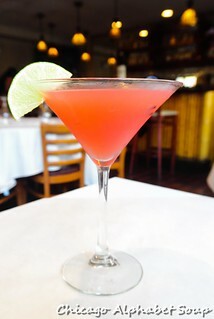 And there was the refreshing Addis Ababa martini. Because this was my first dining experience at Demera Ethiopian Restaurant, I wanted to sample a few items from the menu. We had the doro wot. This came as two chicken legs in a rich barbecue gravy accented with ginger root, garlic, and onions and ayib cheese. There was ye-siga wot, which was the beef version of the doro wot. For vegetables, we ordered the split red lentils ye-misir wot and there was also the ye-dinich ena carrot alicha, consisting of potatoes and carrots stewed with onions, garlic, ginger, turmeric and special house seasoning. The ye-shimbra assa, ground chickpeas in a wot sauce, rounded out our vegetarian selections. And the ye-asa wot was the final offering that we opted for as a seafood selection. All served atop injera and with extra injera, there was only a smear of gravy on the platter when we were done. Not being in a rush, we sat and let our stomachs settle before requesting menus for perusal of desserts. I ordered an Ethiopian style tiramisu. Instead of ladyfingers having been soaked in espresso, they had been soaked in Ethiopian buna, or Ethiopian coffee. 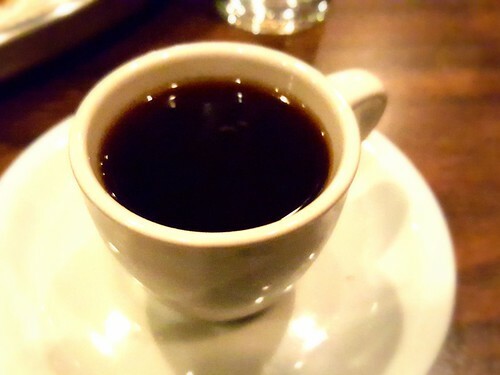 The robust flavor of Ethiopian coffee actually makes the dessert have a stronger taste while not leaving an aftertaste. Drizzled with chocolate sauce, this was heaven. And if heaven wasn’t good enough, the sambussa definitely was perfection. 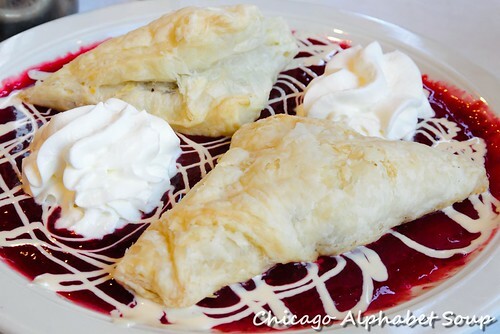 The pastry was filled with with almonds, walnuts, cardamom, rose water, and saffron, and served over a homemade raspberry sauce that was not from a can, box, or jar. Chicago’s Uptown neighbourhood is a location filled with many African restaurants and there is a lot of representation in Ethiopian dining. 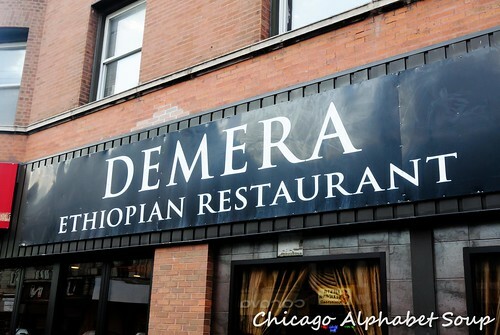 Demera is indeed one restaurant with an inviting atmosphere. Starting with a welcoming air, it is most delightful once the food arrives. 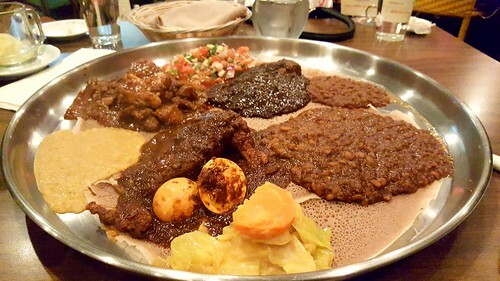 For those who are not familiar with Ethiopian dining, the injera, which is the bread, is used for picking up the food. While the servers may accommodate those who prefer to use eating utensils, the tradition way of eating Ethiopian food actually makes the experience fantastic. And if you go with a large group, it is a most beautiful way of sharing — food that is.